David is an established travel and natural history writer, having authored a biography of the adventurer William Mesny, as well as many guidebooks. I was lucky enough to first visit Borneo as a guidebook researcher in the 1990s. Back then there were few, if any, guided tours and conditions were pretty rudimentary: getting into national parks involved learning enough Malay to catch minibuses – or river boats – to the nearest village and asking around there for guides to take you on foot into the forest. It was always an exciting, but decidedly no-frills, experience; guides tended to glide effortlessly along the vestigial paths, leaving you to clump along behind as best you could amidst soaking rain, humidity, slippery mud, entangling vines and – always – leeches. But despite the rough conditions, right from the start I was utterly captivated by Borneo’s forests, so amazingly alive compared to others I had visited in Africa and Australia. There you had to really track wildlife down; here you were constantly tripping over it. 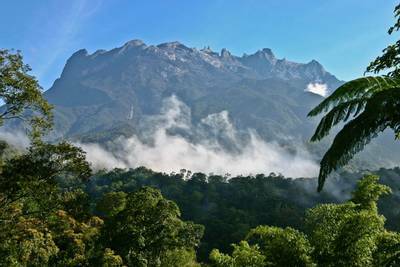 Borneo is the world’s third largest island, covering some 740,000 square kilometres. The southern two-thirds, known as Kalimantan, is Indonesian; the north is split between the Malaysian states of Sabah and Sarawak, and the tiny independent Sultanate of Brunei. With extensive peat-fields in the south and a coastline fringed in mangroves, the interior is a mix of red volcanic soils with limestone and granite bedrock rising to mountains. Covering everything is one of the world’s oldest rainforests, rich in enormous dipterocarp tree species, and cut through by long, looping river systems. It is the combination of river and jungle which really defines any trip to Borneo, creating an unusually broad variety of habitats supporting equally diverse wildlife. Until very recently, all this was left pretty much untouched. Borneo was colonised over 2,000 years ago by the Dayaks, migrants from the south-east Asian mainland, who moved inland along the rivers to settle the interior. Here they lived in longhouses, practised slash-and-burn agriculture, and became notorious as head-hunters. Though Malay, Chinese and Europeans eventually settled the coast too, trading for precious stones and rare forest products, the Dayaks’ fierce reputation went a long way to preserve the interior in a pristine state until well into the twentieth century, when the first roads began to bring development and the widespread clearing of land for mining, timber and agriculture – especially oil-palm plantations. 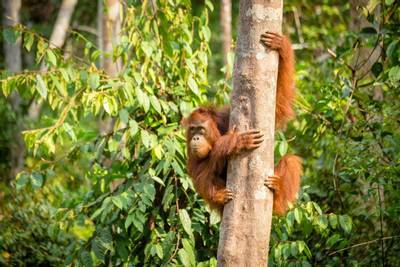 Nowadays the natural forest cover is just 25 per cent of what it was 50 years ago, but much of the remaining pockets are protected within national parks and reserves, where it is still possible to experience Borneo in its natural state – complete with its extraordinary wildlife. 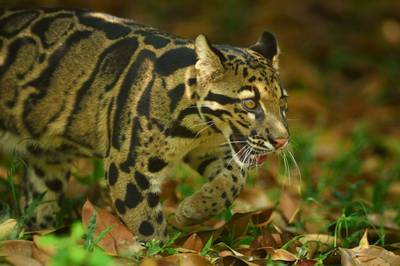 This wildlife includes Gibbons, Malay Sun Bears, the Bornean Pygmy Elephant, over 600 varieties of bird (it’s not unknown to count 70 species a day), and a bundle of cats, including the Sunda Clouded Leopard – but not, strangely enough, Tigers. Borneo is also home to most of the world’s Orangutan; I saw my first not two minutes inside the forest boundary, a young female sprawled on a branch eating durian, that notoriously stinky, spiky fruit which they seem to love. Many successful treks were made at night, spotlighting – looking for animal eyeshine by holding a flashlight at, or just above, your own eye level. It’s not just for larger creatures either, and works well for finding spiders and other invertebrates hidden in tree bark or amongst leaves. Despite the sometimes deafening background chorus of insects, sound is also a useful tool; often it’s a slight noise – claws clattering on bark, a scuffle in the leaf litter – which gives animals away. 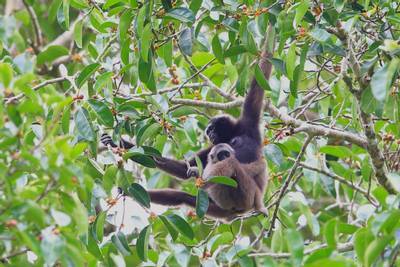 One superb evening kicked off before sundown with spectacular views of a family of long-armed, sad-faced gibbons slingshotting themselves effortlessly through the canopy, making their characteristic “ooo-wah” calls – noisy enough that even I could have found them. Just after dark I had the shock of stumbling across a Sambar doe, which must have heard me banging into vegetation from miles away but had stood stock-still until we were almost close enough to touch, before exploding off into the gloom, crashing through the understory in panic. Then there had been a Tarsier, surely the oddest of all primates: uniquely insectivorous, small enough to fit in a teacup, clawed fingers, head able to turn almost right back on itself and enormous light-sensitive eyes (we turned our flashlight beams downwards to avoid dazzling them). It let us come surprisingly close, and then suddenly it was off with a gigantic leap. Not much further on we came across a tree trunk marked about a metre or so from the ground with deep parallel gouges, evidence of a Malayan Sun Bear staking out his territory. The gouges were fresh – there were even detached shreds of bark which hadn’t fallen off yet – and we might only just have missed seeing the bear itself. To be honest, having looked at the powerful claw marks left on the tree I was glad we hadn’t surprised their owner; Malay Sun Bears are unpredictably tempered, despite being the smallest bear species in the world. Adults are marked with a pale, crescent-shaped bib across their chest – hence the name. A Marbled Cat stood frozen for a second on the edge of a torch beam before melting away without sound or apparent movement, and then we were on the lookout for Colugo, an animal I’d always wanted to see. 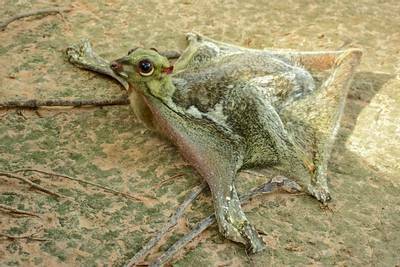 They’re not rare, just downright weird, something like a cross between a green fruit bat and a flying squirrel. It was one of those creatures that people say “oh yes, they’re everywhere” but can’t seem to find when I’m around, each failure making me more determined than ever to see one. Now my guide had promised results; I’d replied that I’d kiss him if he did, which of course might have been a good reason to fail – he’d certainly looked very worried for a moment, before he’d realised I was joking. Suddenly we were out of the forest and back at camp, with my guide waving me over to the line of cabins on the forest edge. And there, halfway up a sapling, were a family of Colugos, climbing rapidly up the trunk to get away from the torch beams before leaping into the dark and gliding off. I noticed my guide standing well back out of kissing range. The perfect end to a great night out. What makes Deramakot so special? Well, Naturetrek have only been running tours to Deramakot since 2017 and it’s a chance to explore a relatively unknown and little visited area. Deramakot is unusual in being a working forestry reserve focusing on sustainable logging – only selected timber is removed, and then that piece of forest is left to recover untouched for 40 years. 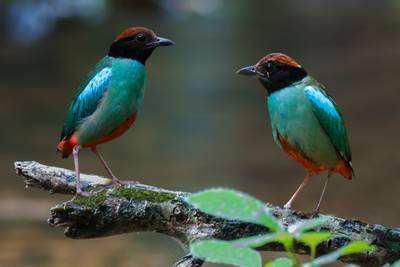 This award winning reserve has a wonderful array of wildlife and with the opportunity for extended spotlighting sessions the magic happens at night as we search for Borneo’s most enigmatic species. In one 90-minute session here on a recent visit our group enjoyed Elephant, Sun Bear and Clouded Leopard, with sightings of this big cat more frequent here than anywhere else. Naturetrek’s Deramakot tours are all about seeing mammals, most of which are nocturnal, so we spend a good chunk of each night out in a four-wheel-drive vehicle spotlighting for them along the logging roads. This way we cover a lot of ground, and the animals are already used to the noise of vehicles, and tend to ignore us. The daytime is spent catching up on sleep and relaxing around the lodge, with some light birding. Just around the lodge and walking the approach roads various hornbills, pittas, sunbirds, broadbills and bee-eaters can be found, with Orangutan regularly seen in the grounds too. The Deramakot tour also includes visits to Sepilok Orangutan Rehabilitation Centre, the Kinabatangan River and Gomantong Caves, so between them that’s Borneo’s three major terrains – rainforest, limestone and rivers – covered. 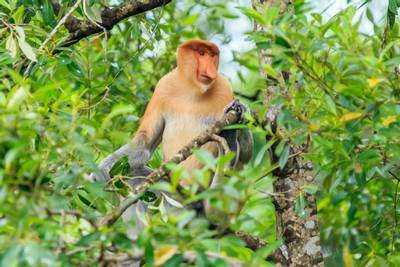 Kinabatangan is superb and should be essential for any itinerary; here we find Proboscis Monkey, other primates, elephants and great birding. 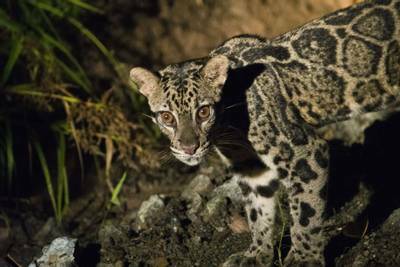 Sunda Clouded Leopard is the ultimate target and we will come across a huge amount of other exciting species as we search. Bornean Pygmy Elephant, Sun Bear, Orangutan, Gibbon and Leopard Cat are other key targets; we try to see all these and more. To date our groups have been very successful seeing all these big target species and we hope for more success in the years to come. The animals really don’t seem bothered by vehicles, so people have had superb views, sometimes from just a few metres away. Having said that, and despite around 60 hours spent looking for them, I didn’t see a Clouded Leopard on this trip but its great fun trying! The better we get to know Deramakot, the more we’ll understand the pattern of wildlife sightings, which will only increase our chances of a sighting. As we search for the main targets we will see a whole host of other species: Binterong, Colugo, Slow Loris, Tarsier, Lesser and Greater Mousedeer, Bearded Pig, Red Giant and Thomas’s Flying Squirrel, plus various civets are very common and we also have a chance of Marbled Cat and Flat-headed Cat. Porcupines and Pangolin have also been seen and the list just goes on! The birding is superb with all eight of Borneo’s hornbill species possible, Bornean Falconet, various kingfishers and raptors, Storm’s Stork and countless more. Although mammals are the focus we still tend to see around 150 bird species. Such prolonged and excellent views of the difficult to see Binterong were fantastic and surprises can be waiting around every corner. We also counted an amazing number of wild Orangutans during the tour, with 18 different individuals seen and sightings at all the locations we visited. 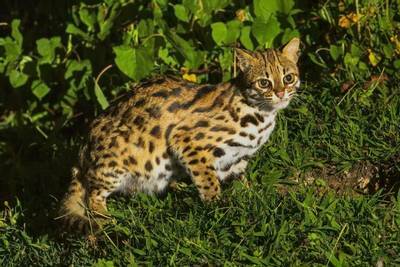 Borneo’s largest cat, still widely distributed through lowland forest, though its solitary habits make it difficult to find. This large, arboreal ape is now critically endangered through habitat loss – though also fairly easy to see within Borneo’s national parks. 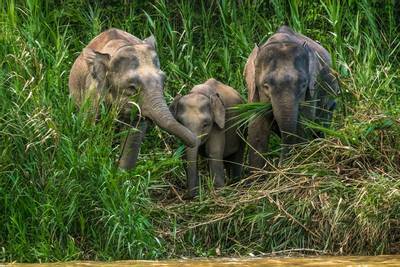 Isolated on Borneo for the last 300,000 years, the small size of this Asian Elephant subspecies is believed to be an adaptation to forest living. 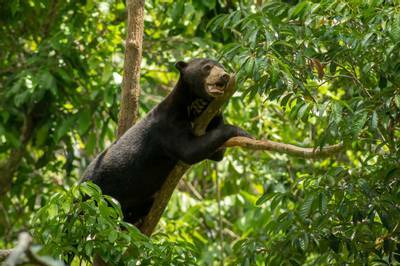 Sun Bear populations are shrinking throughout their south-east Asian range through habitat loss, plus deliberate hunting for the Chinese medicine trade. Borneo’s famously big-nosed monkey, often seen leaping dramatically from tree to tree along the river channels. They’re good swimmers too, and even have webbed toes. 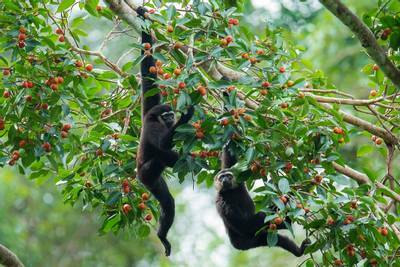 Gibbons are exclusively arboreal, and do not descend to the ground. The species may continue to survive in forests affected by logging, as long as there are sufficient tall trees. 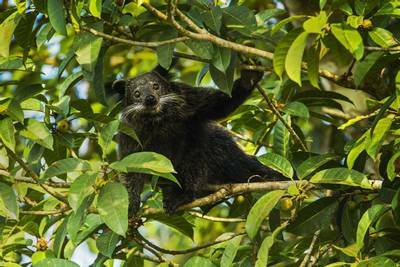 This bizarre animal looks like a cross between a cat and small bear, and is in fact also known as a bearcat. It is related to neither, however, being a member of the Viverridae family which also contains civets and genets. These amazing creatures are the most capable gliders of all gliding mammals. They use flaps of extra skin between their legs as they cruise from tree to tree. 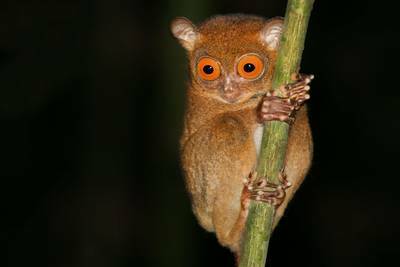 Another bizarre creature, Tarsiers have the largest eyes for their size of any mammal, with each eyeball the size of its brain! The most common of Borneo’s five cat species but strikingly beautiful and scarcely larger than a domestic cat.